Yikes! I just logged on to write this post, and realized that I have not blogged since the last FAEteam exhibition. I blame the flu and the holidays (and maybe even a touch of laziness) for this. 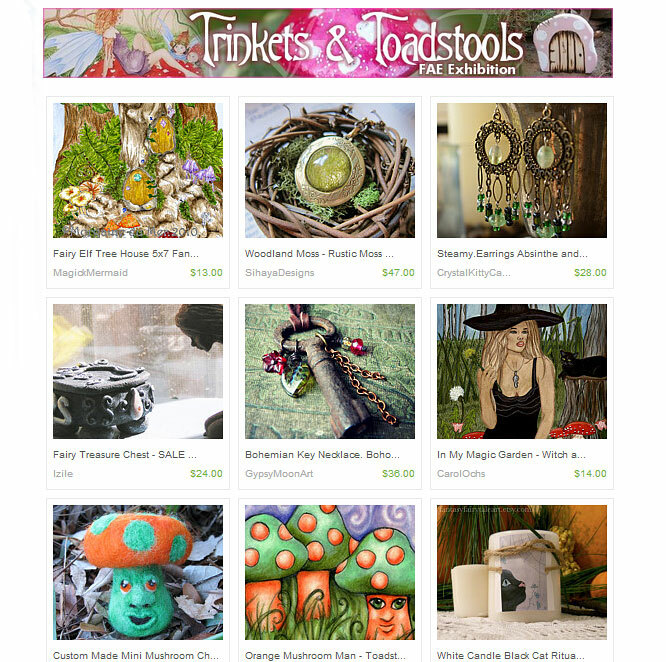 In any case, I’m back, and I’d like to share the newest exhibition, “Trinkets and Toadstools”. As the name implies, this is a collection of fantasy art and objects with a mushroom or trinket-y theme. 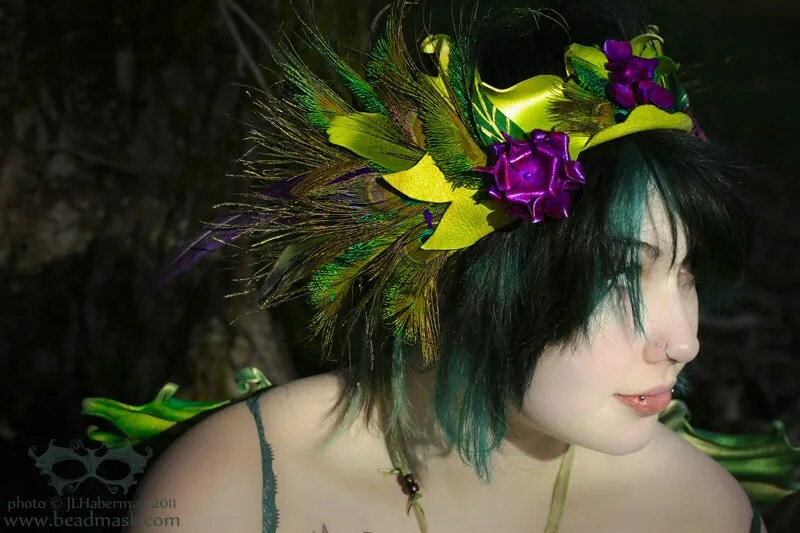 It includes artists prints, fantasy jewelry, candles, hair accessories and so much more. The preview to the right is just a sample. 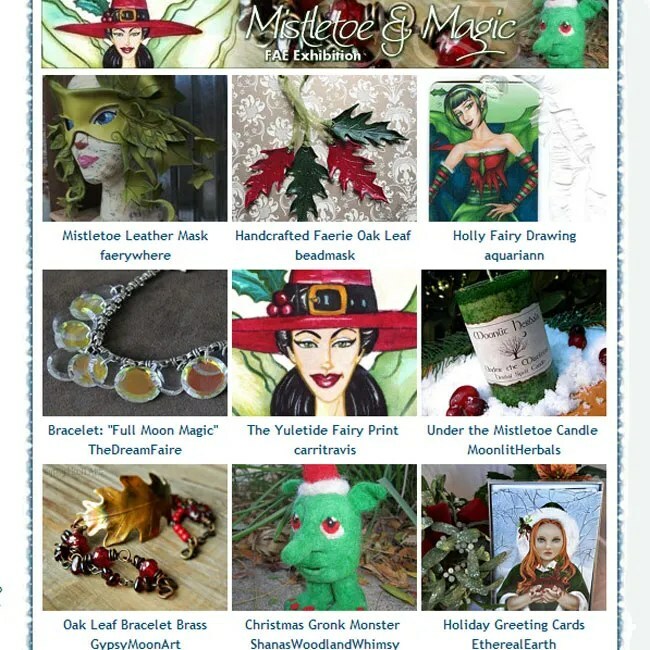 To see the real deal, along with clickable product links, please visit the Fantasy Artists of Etsy blog. The new FaeTeam exhibition is live! This is a collection of winter themed creations from the Fantasy Artists of Etsy. The screenshot to the right gives a small sample of what you’ll find, but the best way to enjoy it is to head on over to the website. A Good Karma section for my shop? My hope is that the charity listings will highlight some of the causes that I believe in, which could raise awareness (and of course, money) for those issues. It also might give buyers a sense of who I am and what inspires me. 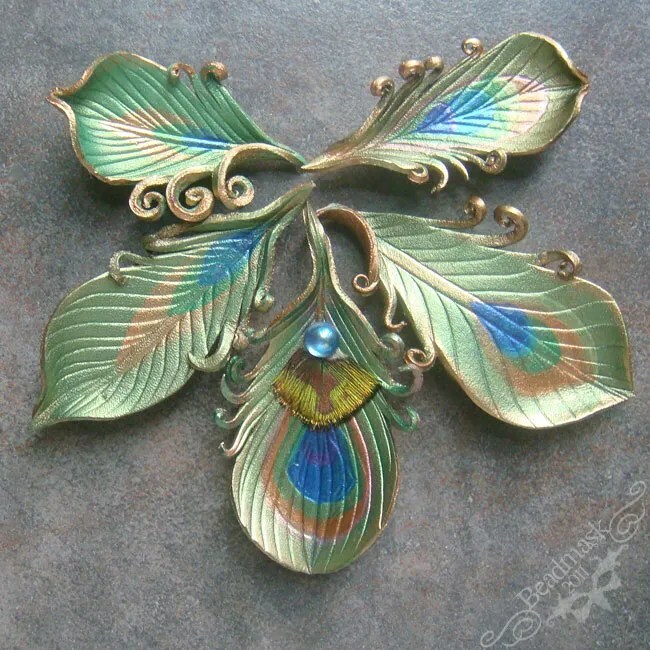 For example, for every one of my peacock products that I sell (barrettes, pins, necklaces and cuffs) a portion is donated to the Seattle Cancer Care Alliance in memory of my friend who inspired that series. I also donate to several environmental groups, the Xerces society, a local Domestic Abuse shelter, Native American charities and disaster relief efforts for events like Hurricane Sandy. Still, I question if this is information that customers want to know, or will sharing this in the context of my business come off poorly? As far as the discounted items, it’s a way to clear out my studio and offer some really sweet deals at the same time. I have quite a few earrings, barrettes and buckskin pouches left over from when I was doing more southwest inspired work; they’re quality pieces, but they’re rather incongruent with what I’m doing now. Items like these might be nice stocking stuffers, or inexpensive options for group gifting. Similarly, I have a few pieces that are a bit shopworn from being handled too much at show. They’re clean, well crafted pieces… but they do have imperfections so I don’t feel right about selling them at full price. This subsection would offer some serious bargains, but could it make my shop look discordant or sloppy? Pro’s: A section like this might enable me to better connect with buyers, highlight causes that I love, offer great bargains AND clear out my studio. Cons: The charity stuff might seem preachy or just be TMI, and the scratch and dent stuff could make the shop look sloppy, haphazard or just cluttered. My time is still at a premium, so I haven’t been creating many Etsy treasuries of late. Today I was compelled to put this one together. The items are mostly unrelated, except that they are all beautifully crafted and inspiring works. 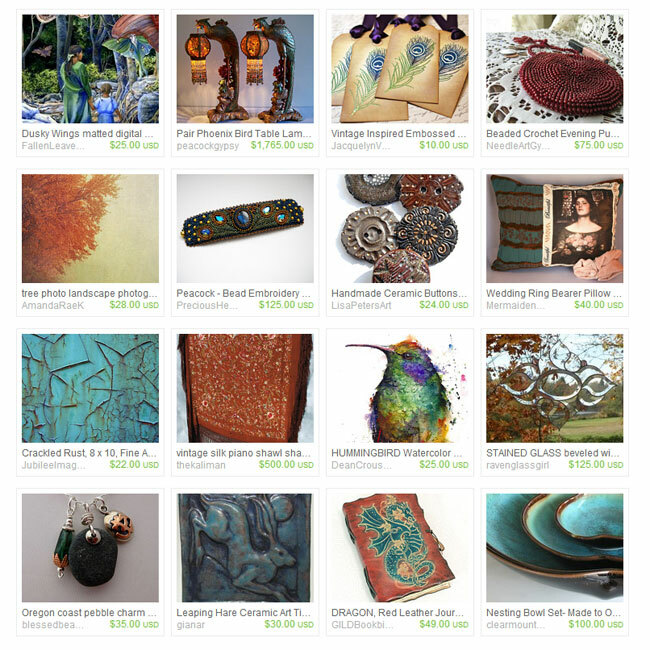 They’re reflective of the colors that I’m most drawn to today… soft turquoise and deep greens, along with rich copper and rust. If you’d like a closer look at any of these items (or perhaps you wish to support one of the independent artists featured here) you can see this treasury here. Here’s a preview of the new winter-themed exhibit from the FAE Team. 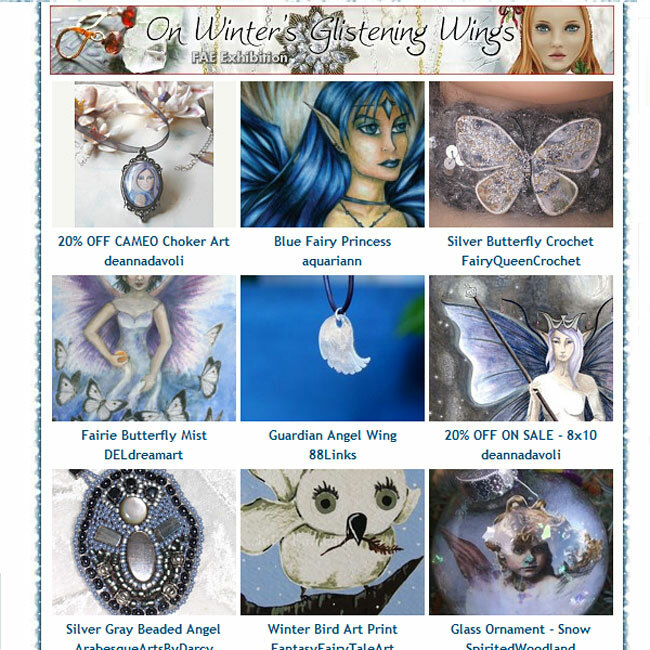 My little screen shot is just the tip of the iceberg … please go visit the exhibition page to see more beautiful winter selections from the Fantasy Artists of Etsy! The giveaway that I did with Aquariann was a very positive experience for me. It generated some nice exposure for my Etsy shop, and the comments helped to give me a sense of which items people are drawn to. I really enjoyed participating in this, and will gladly do it again in the future. 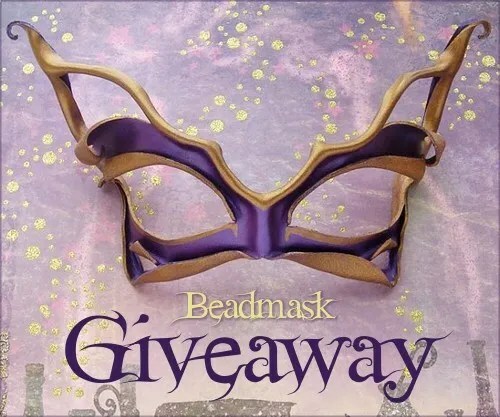 The winner of this giveaway is a photographer and jewelry designer with an Etsy shop of her own. Little Fever uses vintage Swarovski components in her jewelry designs — a woman after my own heart! Her photos are also quite lovely — little nature vignettes that make even the simplest of things seem wonderful and amazing. You can see more of her work on Facebook and in her Etsy shop. When Kristin of Aquariann mentioned that she was seeking new artists to participate in her blog giveaways, I jumped at the chance. Starting today, she is hosting a giveaway for a $30 gift card for my shop. The deadline is August 15th, so if you’d like to participate please visit The Art and Tree Chatter of Aquariann for details on how to enter! Guess what? My brilliant, beautiful daughter is graduating this weekend! To celebrate, I am offering a 15% discount on all items in my Etsy shop just enter the coupon code “graduation” when you check out. Over the years, many people have asked me for tips for selling online. While I’m certainly not an expert, I have learned a few things along the way. I made this list because I kept hearing the same questions — hopefully my experience (and many, many mistakes) will be helpful to my friends who are just starting out. For a bit of background info, I started selling my work at west coast art shows and festivals in the late 80’s. This enabled me to hone my skills and style, while learning some basic sales skills in a real world environment (no small feat for an introvert). My online selling adventures began on eBay in the mid 90’s. For many years that enabled me to be a stay at home mom while still earning a livable wage. That was before they hiked their fees and changed their policies to be a bit less seller-friendly. These days, I find that I prefer selling on Etsy. To be fair, I haven’t sold on eBay in a few years – so I may want to check back and see what it’s like these days – but generally speaking, I find that Etsy’s fees are more affordable and it has a stronger, warmer sense of community. In addition, Etsy customers seem to be more appreciative of hand crafted work, as opposed to many of the eBay bidders who seem to be willing to overlook quality in favor of a “bargain”. (I purchased that last one & felt that it was well worth the price)You could also just skip the above & enlist the help of a talented photographer friend, but I feel that there’s value in knowing how to do things by and for yourself. 2) List often: After my first attempt to sell my artwork on Etsy, I almost gave up. I listed 6-8 items all on the same day and then waited for them to sell, wondering why nobody seemed to notice them. I sold maybe one or two items over a four month period, and it was so disappointing that I didn’t try again until nearly 2 years later. My second time around, I spaced out my listings and listed one or two items a day over the course of a couple weeks. I added new items to my shop as often as possible, and if I didn’t have anything new, I “renewed” older listings so that I would always have something coming up in that first page or so when people search for the types of products that I sell. It only costs 20¢ to renew an item on Etsy, which is cheap advertising IMO. I saw a tremendous difference when I did it that way. Since then, I’ve made an effort to list as often as I can – because I see a huge difference in my sales when I am listing frequently, compared to times when I am not able to list as often. 3) Use clear and detailed titles and descriptions: Too often, I see people trying to get artsy with their titles, without offering enough specific information to make viewers want to click. For example, a title like “Blue Journey” is just fine for an item that’s displayed in a local coffee house where the customer can touch the item and see the connection between the product and its title – but it just doesn’t play as well in an online search. It doesn’t tell the viewer what the product is or does (“Blue Journey” could just as easily be the name of a shirt, a painting, or a pitcher) and customers are probably unlikely to search for abstract titles like this. Instead, think of keywords that shoppers might use if they were trying to find products like yours, and work those into your title. You don’t have to forego your creative title completely, but try working in some concrete information that will help potential buyers to find your products. For example, “Blue Journey – A Hand Painted Silk Tank Dress in Aqua and Cobalt – Size Small” gives the reader far more detail, and is more likely to be picked up in a search. When it comes to item descriptions, it’s definitely a good idea to try and be succinct – but make sure that you’re including all of the pertinent details! As I said earlier, it’s important to remember that the viewer cannot hold or see your wares – you have to bring the details to them through excellent pictures and detailed descriptions. Don’t assume that the viewer is already knowledgeable about your product. Educate them a bit by including a brief background on how it’s made as well as the materials that you use. Other important details include size, fit (if applicable) color and texture. You might also want to mention if it is a one of a kind item, or something that you can re-create in other colors and sizes. 4) Follow YOUR heart: It might be tempting to find another seller whose style or success you admire, and simply try to imitate them; but really, such behavior is quite hurtful. Knock offs often flood the market and undercut the original artist; but even if copying another seller doesn’t hurt their business, it will hurt you. Why? Because stifling your own individuality and creative expression in order to mimic someone else simply isn’t conducive to inspiration, joy, or success. And while those terms may sound flighty and flowery, they do hold value — after all, most artists create because they love to. Because they need to. It’s an important part of how we experience and process life. You can’t get to that if you don’t trust in your own creative voice. Unfortunately, there is no blueprint, no cookie cutter method for success with creative work — so there’s no point in trying to follow in someone else’s footsteps. It is helpful to notice how others market and promote, but reproducing another artist’s product line is unlikely to reproduce their success. You just have to tune in to your own muse, and have the courage to forge your own creative path. I know that sounds esoteric and vague, but please trust me on this one. Respect yourself enough to be yourself — it will shine through in your work, and in turn, in the way that others respond to your work. One is that it give me a reality check on my pricing. Just to be clear, I follow a set pricing formula that ensures that I’m getting paid for my time and covering my business expenses. Many people who sell online are hobbyists or just looking for side income, so I’d never just blindly follow another’s pricing. Still, I do like to make sure that my prices are not unusually high (or low!) compared to similar items of comparable quality. Studying the market can be a great way to spot trends (is that an up-and-coming style, or a niche that is quickly becoming over saturated?) and it also helps me to notice the details that can separate me from the herd. For example, a lot of mask makers use pre-fab beadwork that can be bought by the yard. While it’s pretty enough at first glance, that stuff is mass produced in third world countries using inferior quality beads and questionable labor practices. It’s not my intent to be rude or put down their work; but I can use these differences to talk mine up! For example, I could make a point to mention the rarity and quality of the beads that I use, along with the fact that I hand sew all of my original bead embellishments. Some customers won’t care about details such as this, but many do. That being said, studying the competition can help you to illuminate the details that set your work apart. 6) Join a street team: I joined a local Etsy street team for Seattle artists, and it’s been a huge help. From what I hear, this group is bigger and more active than most — but I would still recommend joining your local group even if it is small. It can be so empowering to network with supportive people in your area — my group has taught me about local shows, credit card processing companies, community events, SEO tricks and much, much more. I also belong to a street team for Fantasy artists, which is very fun. So there’s my list. It’s not an exhaustive resource, but hopefully it’s a good starting point. My learning curve has been pretty steep, so I’d love it if this info can make it a little easier for others. If you find something here that is useful, I’d love to hear about it. By the same token, I’m still learning and striving to improve, so if you have any great advice to share about Etsy, I would love to hear it!